“September reminds me of barbecues,” Kame says. While it’s a month that pretty much falls outside the scope of summer, Kame says she counts it as a part of the season anyway. On the recent Hello! Project tour, Kame was talking about how she wanted to do an all-girls barbecue this summer, so Gaki-san asks her if she managed to do so. Kame did not: she explains this as having been due to her personality that’s quick to get excited about the prospect of doing something… but also just as quick to lose said excitement. Gaki-san recommends that if listeners have been wanting to get a bit of barbecuing done, they should simply do so instead of following Kame’s example and letting the opportunity go to waste. Fan mail #1: The listener heard about Kamei Eri’s recent appearance in a TV drama — her first — and asks her to tell us how it went. Gaki-san says she was watching the episode live as it aired. The next day when she mentioned having done so, Kame said she had yet to see it — it aired at a rather late hour for Kame. When she finally did see it, she says she felt “itchy.” Not only did she have to act in the role of a tsundere maid, she also had to speak in an Aomori dialect. Moreover, one of her foreign co-actors — an Italian male — fell in love with Kame’s character in the story. Gaki-san thought it was interesting to see her co-host surrounded by all those foreigners while wearing her maid outfit. Kame mentions having felt very nervous about the scene where she had to slap someone. This was naturally Kame’s first time in her life doing so, and they had to do multiple takes. “By the end the guy was saying how it hurts,” Kame remembers fondly. Fan mail #2: This listener enjoys listening to Takahashi Ai’s FIVE STARS and hearing how she laughs at things she herself is saying. They ask if our hosts have ever seen Ai-chan in-person, laughing at her own jokes? The hosts have indeed noticed Ai-chan laughing at things she says. “Ai-chan often says she isn’t funny… but I’m convinced that she actually thinks she is,” Kame proposes. If not, why else would she be laughing at her own jokes? Still, as she is the leader of their group, the hosts agree to never say this to her face. Fan mail #3: As Gaki-san and Kame both have short hair at the moment, the listener is curious to know: do they have any plans to allow their hair to grow longer again? Kame feels that the best hair length for her is when it’s down to about her collarbone — that is, right around the time of Morning Musume’s “Kimagure Princess” for example. So, if she was to grow out her hair again, Kame thinks she wouldn’t let it get any longer than that. Besides, as Kame points out, her hair isn’t really “short” anymore — it’s more like a bob cut at this point. Meanwhile, as Gaki-san is a fan of long hair, she says she will definitely grow hers long again. Kame thinks this is probably for the best: when Gaki-san cut her hair short, she was putting in hair extensions before long. Gaki-san says this is exactly right: she prefers to have long hair that allows her to do all kinds of things with it. Song: Mano Erina – Genkimono de Ikou! Kame Quiz: On the morning of today’s show, Kame woke up, ate breakfast, and felt desperately sleepy. She went to bed a second time, asking her mom to wake her up in ten minutes. Just as she was about to fall asleep however, Kame’s mom suddenly walked in and said something to her. What was it? Gaki-san starts to protest, insisting that her guesses were all very close to the correct answer. Kame does not give in to her co-hosts demands for a free point. 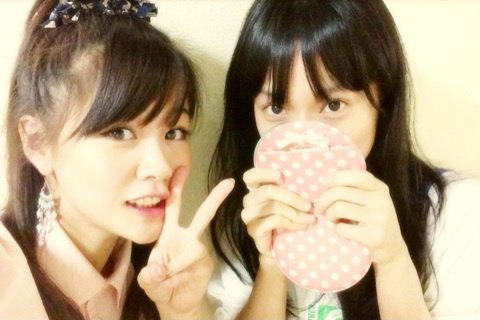 Gaki-san Quiz: Gaki-san went to Hokkaido during her summer vacation. Her question is: what is the very first thing she said after landing at the airport in Hokkaido? Kame exclaims that she’s very confident about her answer: “Hokkaido wa dekkaido!” Gaki-san promptly shoots her co-host down, explaining that she would never say anything so lame. Kame’s next guess is: “it’s hooot!” Much to Gaki-san’s disappointment, this is actually correct. Kame says she can make it even more accurate and guesses that Gaki-san said: “wow, it’s even hotter than I expected!” Gaki-san, annoyed, admits that this is exactly right. The winner of this week’s showdown is Kame. Gaki-san (while imitating a train station attendant): We’re waiting for your messages! Go ahead and ask us anything, such as “if you were to compare Kamei Eri to a musical instrument, what instrument would she be?” Anything goes!